The foundation of a great email marketing plan is an audience of contacts who want to hear from you and engage with your brand. If you don't have a lot of contacts yet, Mailchimp can help you build a signup form to grow your audience. To get started, you'll use the Form Builder to design your Mailchimp signup form and signup response emails. Then you'll be ready to share your form across all your online channels and watch your audience grow. In this article, you'll learn how the Form Builder works. The Form Builder is a Mailchimp tool that you can access from your audience dashboard. You'll use it to design, build, translate, and share your signup form. You can also use the Form Builder to edit other emails and messages that are part of the signup process, like the confirmation thank you page and Final Welcome Email. These forms and emails guide your prospects, customers, clients, and friends through the process of becoming engaged subscribers. The Form Builder is made of three main tabs, Build it, Design it, and Translate it, which you'll use to customize all your forms, signup response emails, and miscellaneous landing pages. Here's a brief overview of how things work. The Build it tab is where you'll add structure and content to your signup form and response emails. Use the Build it tab of the Form Builder to add or remove audience fields, and change field settings. Removing a field from your signup form will also remove that field's data from your audience, so be careful when you delete. The Design it tab is where you'll edit the style, color, font, and graphics of your signup form and response emails. You can also edit the page and body layout of your signup form and response emails here. Any design changes you make here, like changing background color or font, will be inherited by all your other pages and response emails. This helps build brand consistency for all the pages your subscribers will interact with, and saves you some time. The Translate it tab is where you'll translate your signup form and response emails, or customize default text. Mailchimp supports more than 50 languages. If you don't need to translate anything, you can still use this tab to modify default text on form buttons or in error messages. After you design your signup form, you can share it across all your online channels. Just copy your Signup Form URL in the Form Builder, and share it anywhere you want! The editable items appear in four categories in the Forms and response emails drop-down menu: Subscribe, Unsubscribe, Update Profile, and Other Bits. The Subscribe section shows items you can customize as a part of your audience’s subscription process. The items in this section will vary based on which opt-in method you use with your audience. If you use double opt-in, which requires contacts to verify their email address, you'll see the signup thank you page and opt-in confirmation email, which you can also customize. The basic signup form for your audience. Customizable error messages for your signup form that will display if people enter data incorrectly. The reCAPTCHA page that appears after someone enters their information into your signup form. A webpage that thanks new subscribers for signing up, and confirms your audience address and default information. An optional email that you can turn on to welcome your new subscribers. 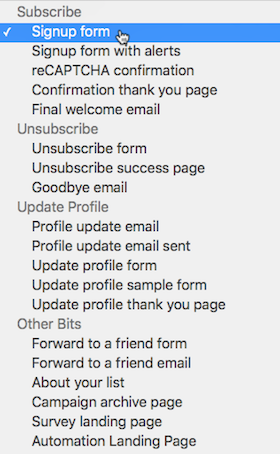 The items in this section show you what your contacts will see when they unsubscribe from your email marketing. If someone clicks an unsubscribe link in your campaign archive, we’ll prompt them to enter and submit their email address to this form. A webpage that confirms a successful unsubscribe. An optional confirmation you can use to say goodbye to unsubscribers. The items in the Update Profile section show you what contacts will see when they request to update their profile information like their email address, group preferences, or audience information. A confirmation email sent to subscribers who’ve filled out the update profile form. A static webpage that confirms that Mailchimp sent the profile update email. The form your subscribers can use to update their information. Can be linked in campaigns using the *|UPDATE_PROFILE|* merge tag. A form contacts will see when attempting to update their profile through a test campaign or archive page. A webpage that confirms a successfully updated profile. This section displays miscellaneous forms and pages connected to your audience. A form subscribers will see when they click a Forward to Friend link in your campaign. A static information page for your audience that contains your audience details and permission reminder. Can be linked in campaigns using the |ABOUT_LIST| merge tag. A shareable archive page containing links to the 20 most recent campaigns sent to your audience. The landing page subscribers will see when they vote in a survey you’ve created with the survey merge tag. This page shows when subscribers opt in or out of an automation series that uses join or leave automation merge tags. Some parts of your signup forms and response emails are linked to audience information and can’t be edited in the Form Builder. To edit your audience name, go to your audience defaults. To update the website, physical address, or permission reminder for your audience, you’ll need to update Required Footer Content in your audience settings. Let's do this! Follow along with our step-by-step tutorial to create your own signup form in the Form Builder.